Fred McGriff was a fantastic first basemen for the Jays who led the American League in homers back in 1989, but he's best known around here as a key part of The Trade. The Trade, the trade that eventually resulted in two World Series championships, had McGriff and Tony Fernandez shipped off to San Diego Padres in exchange for Roberto Alomar and Joe Carter. Here's an interesting Fred McGriff tid bit from the 88 Topps Card blog. From 1988 to 2002, which two players have the most seasons with at least 22 homers? Of course Fred McGriff is one, or else I wouldn't be citing the stat. Barry Bonds is the other. We already know Rance Mulliniks was the first person to hit an inside the park homer at SkyDome, but who was the first person to clear the fence at SkyDome? 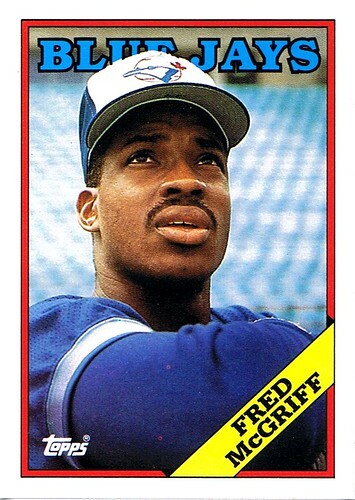 It was Fred McGriff, The Crime Dog.